Sundays are my favorite day to bake. I love coming home from church and thinking up a way to make something yummy and new. Maybe it's because my best sous chefs are around! This past Sunday we made an Apple Caramel Bundt Cake that was better than any cake I've had in a long time. It might even trump my Pineapple Carrot Cake. 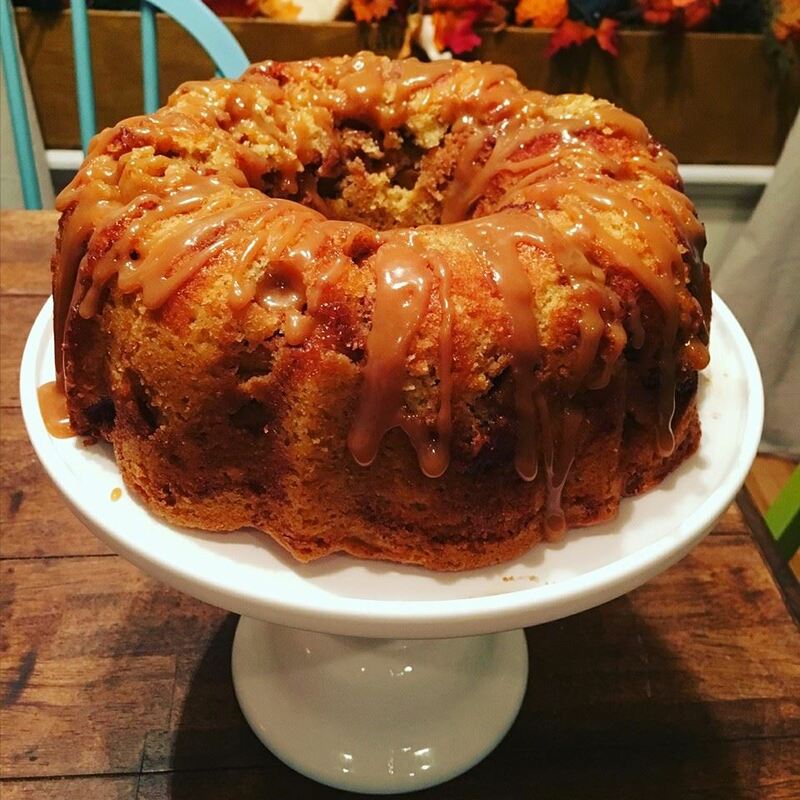 It uses chunks for sugared cinnamon apples in a rich homemade vanilla cake and is topped with my favorite caramel drizzle. Served with a scoop of vanilla ice cream it might cause uncontrollable outbursts of mmmmm's and ahhhhh's! Besides it's taste...it gave me a chance to use my vintage bundt cake pan!!! 1. Grease well your bundt pan. Preheat oven to 350 degrees. 2. Mix together peeled and chopped apples with cinnamon and brown sugar. Set aside. 3. In your stand mixer, whip the white sugar with the softened butter until soft. Add eggs one at a time until incorporated. Add vanilla. 4. Sift together flour, baking powder and salt. Add to butter/sugar mixture one cup at a time. 5. Slowly add the milk until the batter is smooth. 6. Add about an inch of the batter to the bottom of the pan. Spoon in half the apple mixture. Add a couple cups of batter over the top of the first apple layer. Add the rest of the apple mixture and top with the rest of the batter. 7. Bake in the 350 degree oven for 45 minuets until an inserted toothpick comes out clean. Let cool 20 minutes and tip over onto serving plate. 8. Top with my Homemade Caramel. Serve with ice cream. Oh my....this is sooooo good with the mesh of warm apples, caramel and a rich vanilla cake. This recipe is a must make before winter comes!